The name Arctic comes from the Greek word "arktikos" meaning "near the bear" or "northern," and that word derives from "arktos," meaning "bear". The name refers either to the constellation Ursa Major, the "Great Bear," which is prominent in the northern celestial sphere, or to the constellation Ursa Minor, the "Little Bear," which contains Polaris, the North (Pole) Star. The polar climate is characterized by persistent cold and relatively narrow annual temperature range. Winters are characterized by continuous darkness, cold and stable weather conditions, and clear skies. Summers are characterized by continuous daylight, damp and foggy weather, and weak cyclones with rain or snow. The maximum snow cover in March or April is about 20 to 50 centimeters over the frozen ocean, and lasts about 10 months. The central surface is covered by a perennial drifting polar icepack that, on average, is about 3 m thick, although pressure ridges may be three times that thickness. The icepack is surrounded by open seas during the summer, but more than doubles in size during the winter and extends to the encircling landmasses. The ocean floor is about 50% continental shelf (highest percentage of any ocean) with the remainder a central basin interrupted by three submarine ridges (Alpha Cordillera, Nansen Cordillera, and Lomonosov Ridge). There are major surface currents. Two major, slow-moving, wind-driven currents (drift streams) dominate: a clockwise drift pattern in the Beaufort Gyre in the western part of the Arctic Ocean and a nearly straight line Transpolar Drift Stream that moves across the ocean from the New Siberian Islands (Russia) to the Fram Strait (between Greenland and Svalbard). Sea ice that lies close to the center of the gyre can complete a 360 degree circle in about 2 years, while ice on the gyre periphery will complete the same circle in about 7-8 years. Sea ice in the Transpolar Drift crosses the ocean in about 3 years. The major chokepoint is the southern Chukchi Sea (northern access to the Pacific Ocean via the Bering Strait). This strategic location between North America and Russia is shortest marine link between the extremes of eastern and western Russia. There are floating research stations operated by the US and Russia. Canada, Russia, the US, Denmark [via Greenland] and Norway are staking claims in the Arctic Ocean, which may contain a quarter of the world's untapped petroleum reserves, and is becoming more accessible due to global warming. 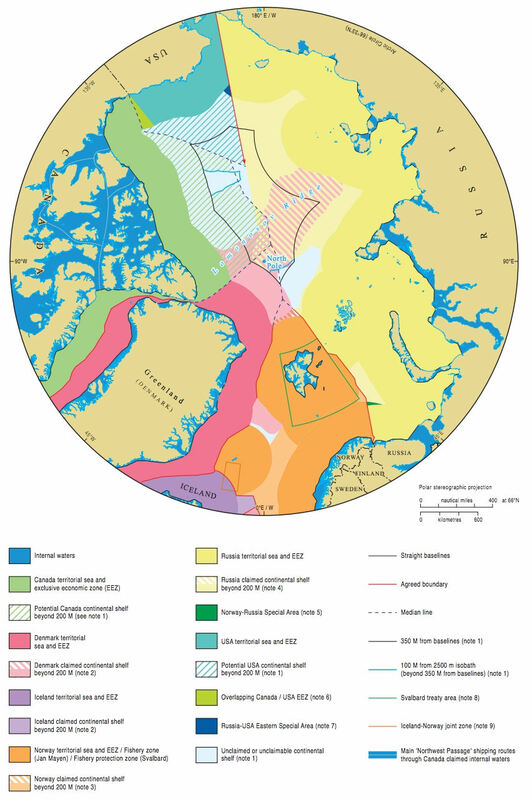 Under the Convention on the Law of the Sea, they could acquire rights to Arctic seafloor territory if the areas are linked to their continental shelves. Russia made its claim in 2001, though it will make a resubmission. Canada ratified the Law on the Sea in 2003, so it had to file its claim by 2013. The United States had not ratified the Law of the Sea Convention. The climate in the Arctic is changing faster than in midlatitudes. This is shown by increased temperatures, loss of summer sea ice, earlier snow melt, impacts on ecosystems, and increased economic access. Arctic sea ice volume has decreased by 75% since the 1980s. Long-lasting global anthropogenic forcing from carbon dioxide has increased over the previous decades and is anticipated to increase over the next decades. Temperature increases in response to greenhouse gases are amplified in the Arctic through feedback processes associated with shifts in albedo, ocean and land heat storage, and near-surface longwave radiation fluxes. In response to increased Arctic shipping traffic, on 25 January 2018 the United States and Russian Federation proposed a system of two-way routes for vessels to follow in the Bering Strait and Bering Sea. The nations jointly developed and submitted the proposal to the International Maritime Organization to establish six two-way routes and six precautionary areas. Located in U.S. and Russian Federation territorial waters off the coasts of Alaska and Russia’s Chukotskiy Peninsula, the routes are being recommended to help ships avoid the numerous shoals, reefs and islands outside the routes and to reduce the potential for marine casualties and environmental disasters. The proposed two-way routes will be voluntary for all domestic and international ships. No additional aids to navigation are being proposed to mark the recommended two-way routes and the routing measures do not limit commercial fishing or subsistence activities. “Over the past decade, the U.S. and Russia have both observed a steady increase in Arctic shipping activity,” said Mike Sollosi, the chief of the U.S. Coast Guard Navigation Standards Division. Increased commercial and recreational traffic bring the increased risk of maritime casualties, Sollosi said, and the bilateral proposal for routing measures is designed to reduce that risk. “The U.S. Coast Guard is engaging international and interagency partners across borders in developing joint proposals for ship routes in waterways that we share,” he said.